I’m off on holiday for two weeks now so I won’t be blogging until I get back. Hopefully I’ll be knitting while I’m away. I’ve chosen two projects – one is simple and the other very very simple. Perfect – I hope. Now I’m wondering if I need a third project in case I finish the other two….not that this is likely, but maybe there’s a corner left in the car that can be filled with more yarn? What’s your ideal holiday knit? I am not known for my crochet skills. So imagine my horror when a “mystery knitalong” I joined last year culminated in a “surprise” crochet edging. I had knit each “clue” really carefully because it was the first mystery (i.e you don’t know what you’re knitting) knit along I’d joined. My 4 weeks of beautiful lace knitting was now going to be edged with some dodgy beginners crochet. The hook size was a mystery too. 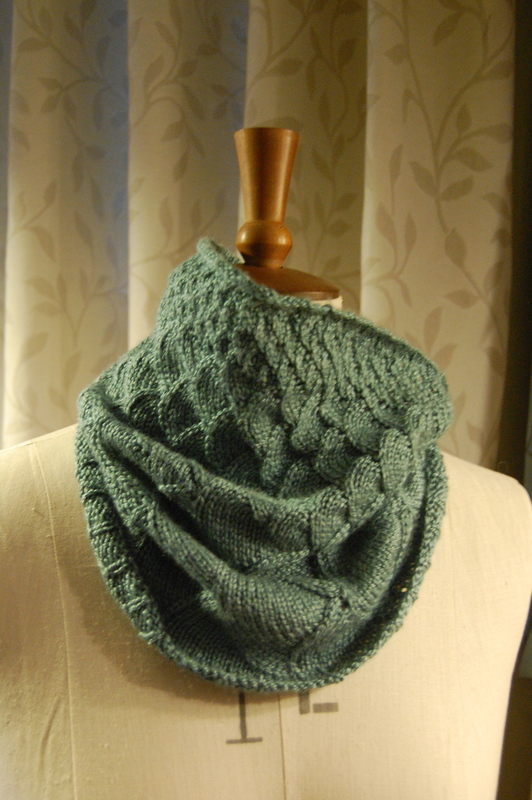 I loved the long Song of Sea cowl so much that I wanted to make a smaller one from some Fyberspates Scrumptious that I had left in my stash. I put the snug pattern in from the start, since I doubt I will be the only one who’d like a snug cowl too. It’s felt a bit strange knitting one of my own patterns as a “project” but I desperately wanted my own one to wear – it was fun being part of the KAL in my group, especially since I don’t often get the chance to do a KAL.